The PJ-3280 NVMe SSD is designed to boost the performance of desktops or laptops without breaking the bank. It comes in 128, 256 and 512 GB capacities and, thanks to the PCIe Gen 3 X2 interface, it can reach sequential reading speeds of up to 1,600 MB/s plus writing speeds of up to 950 MB/s, making it 3 times faster than SATA III SSDs. As prices for NAND memory chips have been continuously dropping this year, more and more affordable NVMe solutions keep hitting the market. On one hand, this can accelerate the decline of traditional HDDs and SATA SSDs, but, on the other hand, this is also a boon for users who are looking to boost the PC performance without investing in new processors and RAM. 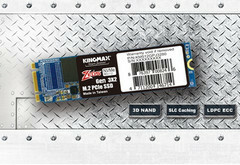 Speaking of budget solutions, Kingmax is now making it easier to transition into NVMe SSDs with the budget-friendly PJ-3280 PCIe Gen 3 X2 model. 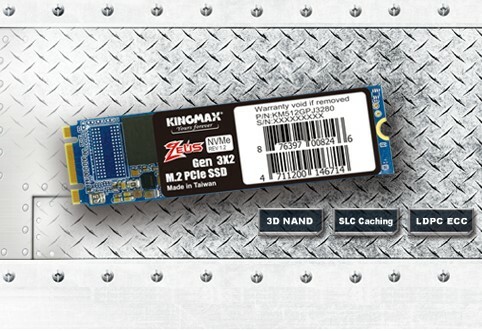 Kingmax does not specify what NVMe PCIe controller is included with the PJ-3280 model, but the 3D NAND flash memory chips are most likely manufactured by Toshiba. The new SSD comes in a M.2 2280 form factor with no additional heat spreaders, so it can fit desktop PCs as well as laptops. As far as performance is concerned, the PJ-3280 NVMe SSD offers up to 1,600 MB/s sequential reading speeds and up to 950 MB/s writing speeds (depending on capacity), which would make it around 3 times faster than the top SATA III SSDs. Since it is a budget solution, capacities range between 128 and 512 GB. Kingmax has not yet disclosed the actual prices for the new budget models, but these should be around US$100 for the 256 GB variant.